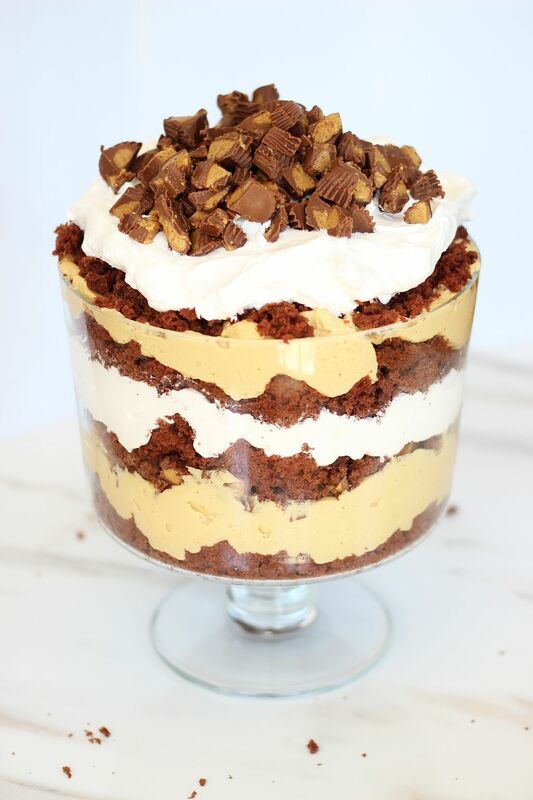 Chocolate cake, peanut butter pudding, and tons of Reese’s cups make up this super easy and decadent Peanut Butter Cup Trifle! And it definitely serves a crowd! 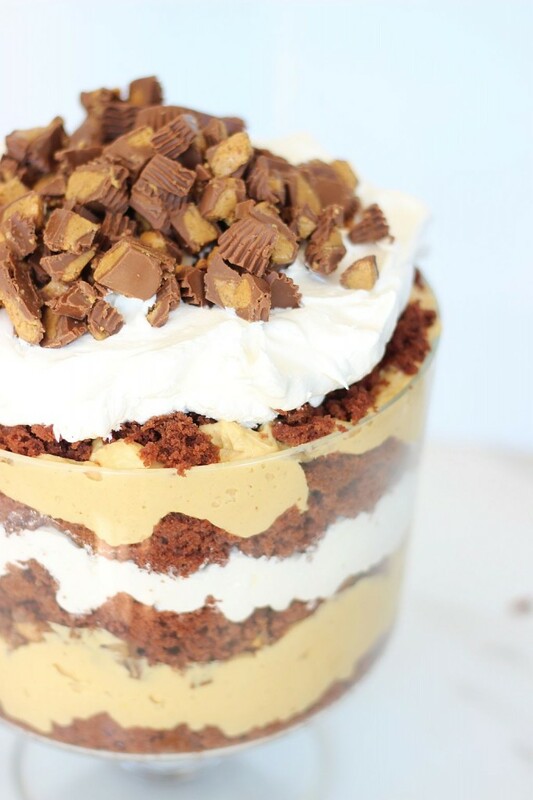 I wax poetic about my love for peanut butter all the time, and I think that a love of peanut butter is a totally normal thing, but I didn’t realize how much I take this adoration for peanut butter to the next level. 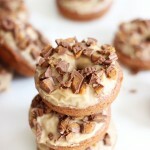 Recently, we were out to dinner with friends when we started talking about peanut butter – why?? I don’t remember. I guess if you love this food, it becomes a regular dinner conversation topic? Maybe that in and of itself should be a sign that I’ve taken things too far! In any event, my S.O. was telling our friends that we have so much peanut butter in the house that we have backup containers for our backups. This is true. 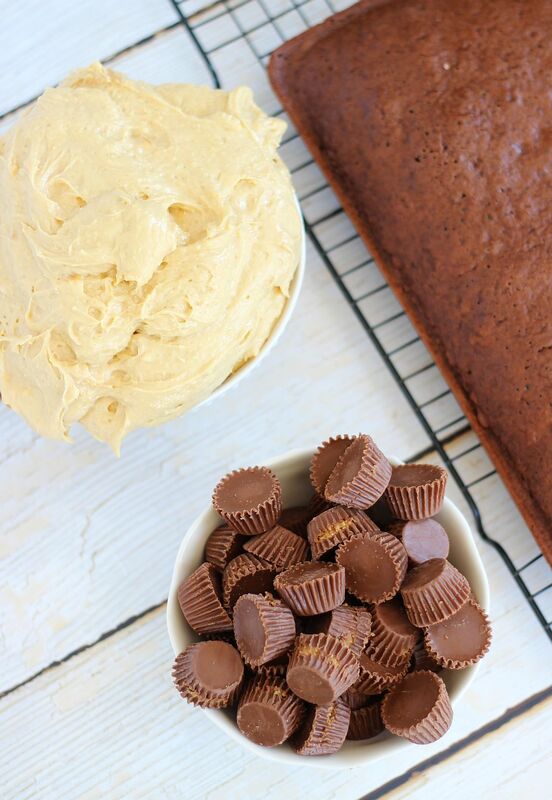 We could feed an army on peanut butter. I hoard it. I count 5 containers right now, and we are not talking about the little ones. The big tubs. The ones you buy from Sam’s Club. Those. Then I was explaining that we really “need” to have a lot of peanut butter on hand because I eat it 3x/day, every day. The entire group gawked at me like an alien. Jaws dropped. Um, I guess that’s a lot more than a typical human consumes? At what point do I admit that I may have a peanut butter problem? Because, see, I view all of this as normal. Also normal: buying a 3lb. bag of mini Reese’s cups. It’s normal, dangit. Stop looking at me like that. 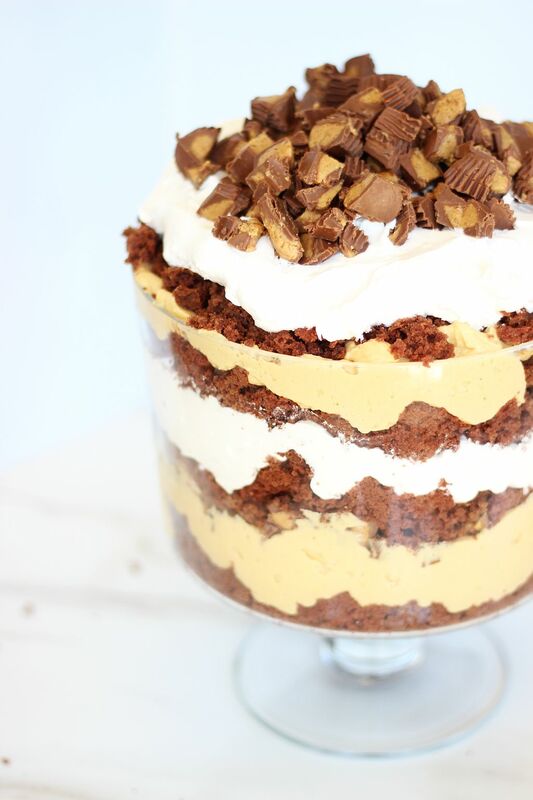 I’ve been meaning to create a Peanut Butter Cup Trifle Recipe for a while now, and just hadn’t slapped it together yet, but the enormous bag of mini Reese’s gave me the push I needed to make it happen. 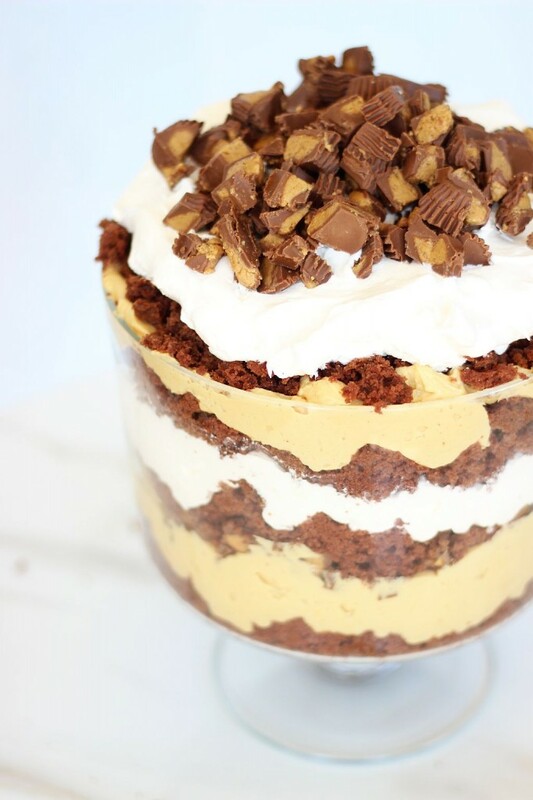 Layers of moist chocolate cake, luscious peanut butter pudding, whipped topping, and chopped Reese’s cups are a chocolate and peanut butter-lover’s delight. 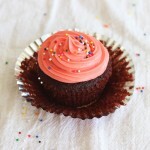 It’s also so simple to make, but it looks so beautiful and elegant! It makes quite a statement. And it weighs a TON. Seriously, it has to weigh 10lbs. I don’t even know how it’s possible. I threw this thing together pretty quickly. And when I say I “threw” it together, I literally mean that I threw it together. 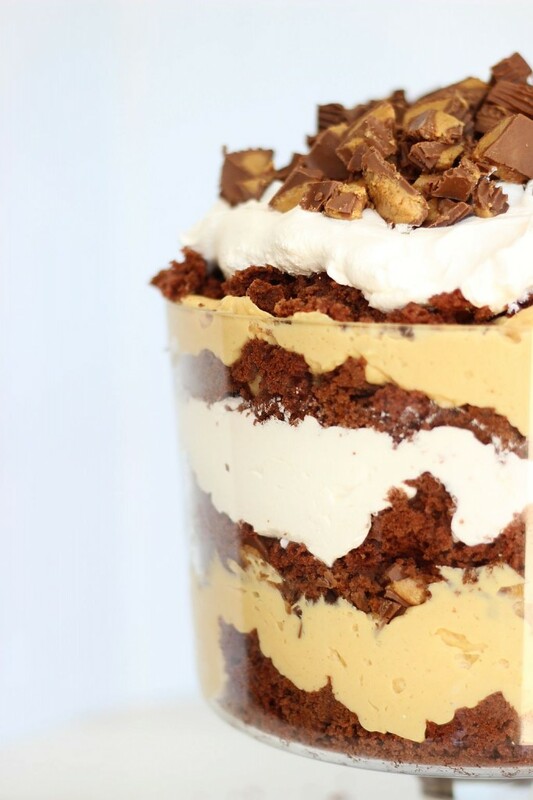 Trifles don’t need precisely even layers, and they don’t have to be perfect – that’s actually part of their charm! Or am I just making excuses for the fact that my trifle has wonky and uneven layers, and is bursting over the top of the dish?? Maybe a little. But just toss everything together layer by layer, and you’re done! 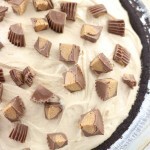 It’s so luscious, decadent, and the ultimate in combining peanut butter with chocolate. 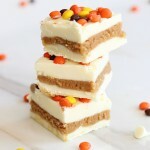 It’s easy to make, but definitely impresses! I love trifles – so easy and so many options! Thanks, Blair! to lick the almost empty jar. It’s her favorite treat! 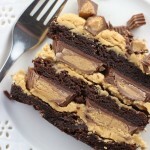 Anything with chocolate and peanut butter is a winner in my book! This is screaming my name!